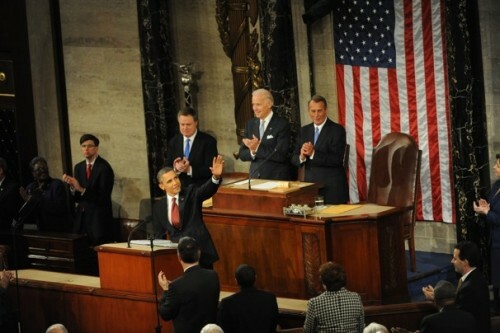 If Applause was Banned During the State of the Union Address, Who Would Suffer? Clap Your Hands and Say Yeah: The State of the Union is as much about posturing as it is about the actual state of the Union. Once the State of the Union actually starts, it becomes immediately clear the speech will take twice as long as it needs to because of breaks for applause. People need to clap, and much too frequently, they need to give a standing ovation. And for the geriatric branches of congress, the senate, the cabinet, etc., standing up and sitting down is not a one-second proposition. People, why must you drag this dog and pony show out longer than it needs to be? But there’s one other thing to consider. The people who would suffer most if clapping was vetoed would not be those who are so eager to smack their hands together until they are the color of strawberries and eggplants. No, the people who would really suffer without clapping are those who try to make a statement by refraining from applause. The president wants raise taxes on the richest 1 percent — Democrats cheer madly, but the Republicans want everyone to know they object. So they sit quietly. If it wasn’t for the clappers, perhaps no one would know who stands (literally) for what. And in a weird way, without clapping, perhaps its the audience watching at home who is truly short changed. Think about it. When the president launches some liberal rally cry — and every Democrat in the building is on their feet — where do the television cameras inevitably point? To someone in the Republican party, crinkling their face, lips pressed tight, probably frowning. It’s like someone sitting next to them unleashed a fart that was cooked up after downing 40’s of PBR and eating a chorizo burrito with double jalapenos. And the scent has finally made it’s way up their conservative noses. But in world with no State of the Union applause, when the president delivers that same liberal rally cry, and the camera decides to focus directly on Eric Cantor, how is the audience supposed to know if the face he’s making is because he vehemently disagrees with the commander-in-chief, or because Paul Ryan is sitting next to him, and the Wisconsin congressman’s insatiable appetite for his home state’s dairy products has resulted in fetid flatulence? So forget the first few paragraphs we wrote. On second thought, perhaps we need the clapping. We need to know why certain politicians are making “I just smelled a rancid fart face,” and more importantly, we need noise to drown out all the farting going on during the State of the Union.